A group of hapless teenagers travel through backwater Texas and to their detriment crosses paths with a creepy, cannibalistic, sadistic family who abducts, terrorizes, slaughters and eats their victims. 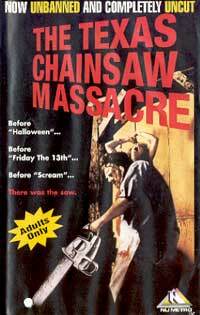 This film gave birth to one of the screen's most vivid anti-hero killers, the chainsaw wielding Leatherface (getting his name from the peeled human face he wears like a mask). The morose atmosphere erupts into pockets of brutal intensity even when the horror is more often than not implied or off-screen - the menacing sound of Marilyn Burns' blood curdling screams and the pursuing revving of Leatherface's chainsaw making quite an impact. While the remake wasn't a disaster, none of the sequels and spin-offs managed to capture the gritty terror and cult status of this original shocker. The first widescreen release for TCM's 25th Anniversary unfortunately feature no extra footage or documentaries. Several other editions include loads of cool extras.